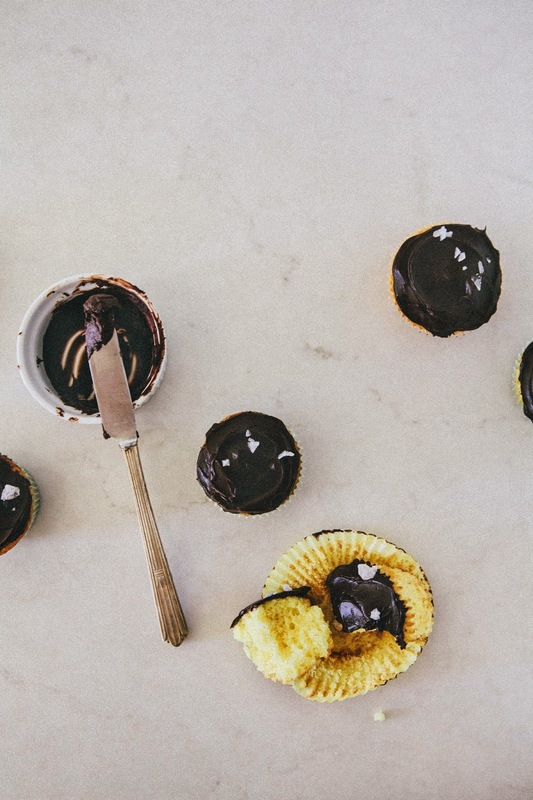 Yellow Cupcakes with Dark Chocolate Crème Fraîche Frosting and Flaky Sea Salt + A Giveaway! A few weeks ago, I was invited to tour Bob’s Red Mill factory. Even though I’ve lived in Portland for a cumulative total of 10 years, it was the first time I’d ever visited their factory — which is really quite a shame on me, since the factory is only 10 minutes outside of Portland. I’ve always been a fan of Bob’s Red Mill products; if I needed an obscure flour or some other ingredient, often times I would check their online store and find that they offered it. It was also a relief, knowing that I could count on their products to be high-quality — I’ve been burned in the past, buying cheap almond meal and having my baked goods come out a tad too oily or off-colored. But with Bob’s Red Mill products, I never had any problems. It wasn’t until I took the actual tour, however, that I discovered how cool of a company Bob’s Red Mill actually is. For starters, Bob of Bob’s Red Mill is an actual person — you guys should have seen the look on my face when he walked in the room to introduce himself! I know that I probably sound silly for saying that, but the cynical marketer in me thought that “Bob’s Red Mill” was just a cute little marketing tactic. But nope, Bob of Bob’s Red Mill is really, actually a man named Bob Moore, who started making the company’s products with a red flour mill back in the 1970s. Since then he and his wife have turned what started out as a retirement hobby into a behemoth of a factory — not to mention a highly profitable business, rejecting lucrative offers for buyouts and IPOs and instead giving the company back to their employees by making the company 100% employee-owned. How cool is that? As for the quality of their products, I knew I wasn’t making it up in my head. Bob’s Red Mill is one of the only few companies that does almost all their production in-house; that is, processing, washing, and inspecting the grain, as well as testing products in their own laboratories. As an example of this intricate quality control of their products, Bob’s Red Mill segregates gluten-free products from the others, and even tests them in special gluten-free only clean room facilities. Bob’s Red Mill is also one of the last few flour mills to use quartz stone millstones to make their flours; almost all other companies use high-speed rollers. Stone milling has been around for centuries, but because it is slow and expensive, most other companies moved to cheaper and more efficient means. Of course, this comes at the cost of quality — stone milling allows you keep more of the whole wheat’s nutrients due to the stones’ cooler temperatures, and some studies have shown that stone-milled flour can reach higher temperatures when baked. It’s rare to find actual stone-ground flour, but almost all of Bob’s Red Mill products are. So, to say the least, I walked away from the tour with a newfound appreciation for Bob’s Red Mill as a company as well as their products. After the tour, I went to their nearby restaurant and store — which contains ALL their products at discounted prices, plus a bulk section including herbs and teas — and went to town. I bought all the ingredients for the recipes that I’ve had my eye on for some time now, but have just been too lazy and/or cheap to source — stuff like whole wheat graham flour and potato starch. “Potato starch!” I hear you judging. Of all the things I could have bought at Bob’s Red Mill’s flagship store, I went with a obscure thickener? 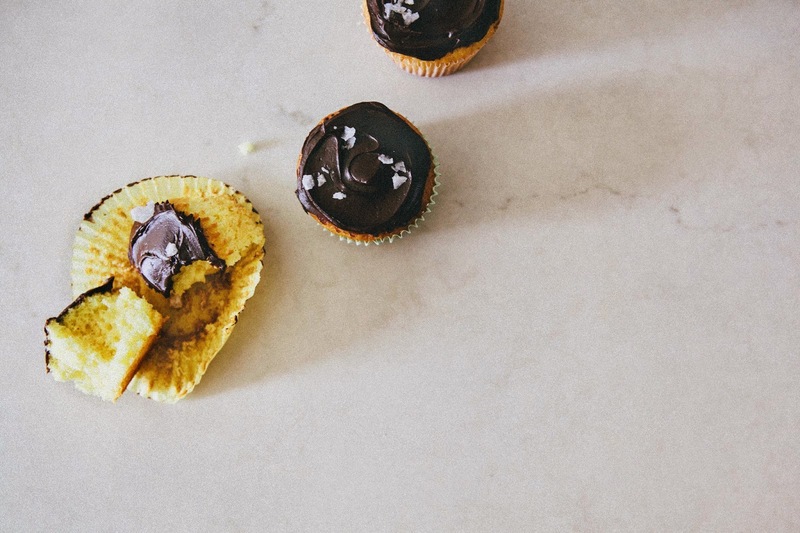 But see, Miette, one of my favorite cookbooks from the beloved San Francisco bakery, has a recipe for yellow cupcakes that I’ve had my eye on since I bought the book three years ago. Unfortunately, I’ve never been able to make it because, well, where on earth does one get potato starch? Bob’s Red Mill, that’s where. 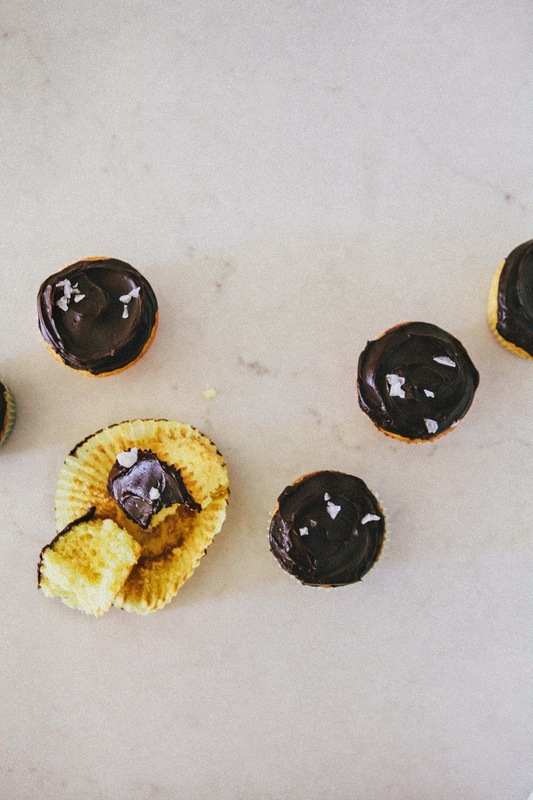 And she’s right — because yellow cupcakes with chocolate frosting? Pretty simple, pretty classic. But what really elevates the cupcakes are the ingredients they’re made from. That yellow cake? All natural, with its sunny yellow coming from ever-so-slightly warmed eggs emulsified a cream and melted butter concoction. Both are just barely cooked before going into the batter to preserve their yellow color. 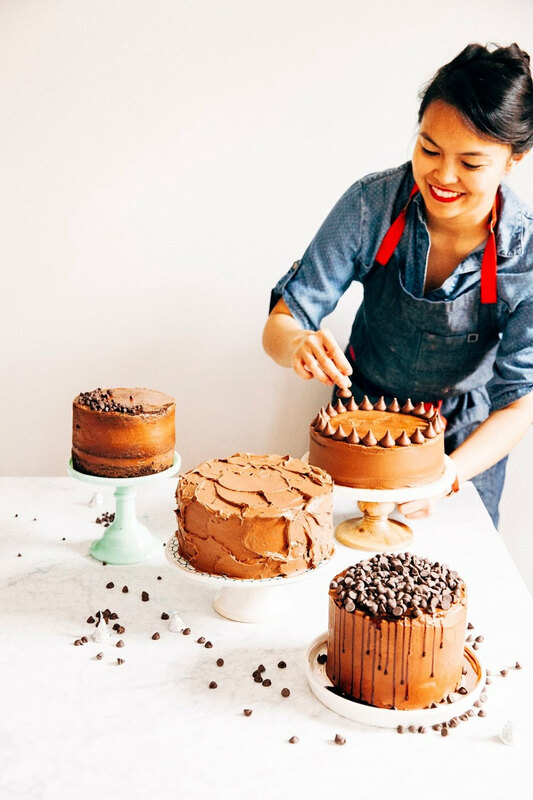 If that sounds a bit heavy to go into a batter, don’t fret — that potato starch is essential to this recipe, lightening what would otherwise be a dense and heavy crumb into a moist and fluffy one, but still giving the cake enough strength to hold its own against a heavy chocolate frosting. And yes, that frosting! With no added sugar (with the exception of a spoonful of corn syrup to give it a smooth texture), it’s 72% cocoa chocolate melted down with crème fraîche (because why have sour cream when you can have crème fraîche?! ), butter and nothing else. The result is an intense and not very-sweet deep chocolate flavor that’s for all you dark, dark, dark chocolate lovers out there. 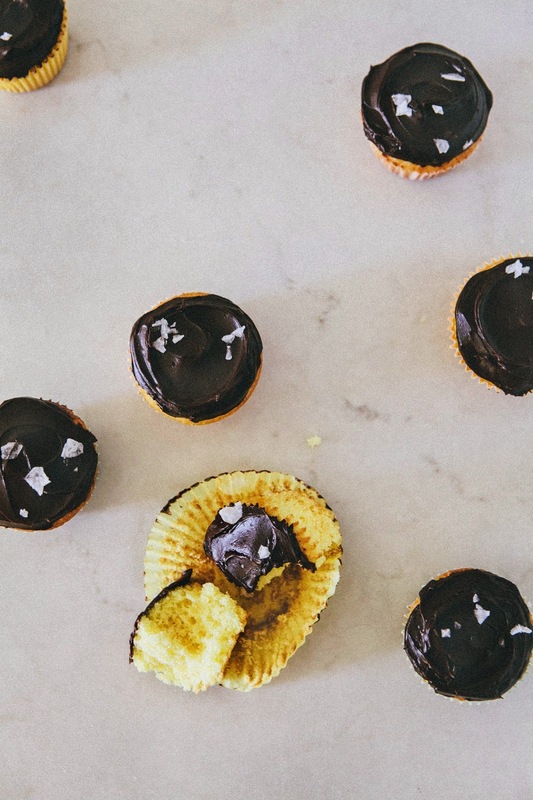 So, yep, these cupcakes are really proof that all you don’t really need to get all that fancy to make an absolutely epic baked good — just simple flavors made from high-quality products and ingredients. The giveaway lasts for one week and ends next Monday at November 3, 2014 12:00AM PDT. I'll announce the winner shortly on this post and reach out via email after that. To learn more about Bob’s Red Mill, be sure to check out their awesome website (which has great histories on Bob, their products, as well as nutritional information on whole grains and gluten-free eating. You can also get the latest company news on the Bob’s Red Mill Facebook page! The giveaway is now closed. Congratulations to Rose Marie!!! This chocolate frosting is intense. It’s not very sweet, so if you prefer something a little more traditional and akin to regular cake frosting, I would recommend using a milk chocolate that only has 30-40% cocoa. Preheat the oven to 350 (F) and prepare two standard cupcake trays by lining with 18 cupcake liners. Set aside. In a saucepan over medium-low heat, combine 1 cup unsalted butter and 1/2 cup milk, stirring occasionally just until the butter is melted. Once the butter is melted, remove from heat immediately and set aside. Let cool to slight above room temperature; an instant-read thermometer should register between 80 to 85 degrees (F). In a microwave safe bowl, whisk 3 large eggs with 2 teaspoons vanilla extract. Microwave on low for 20-second intervals, stirring between each interval, until the egg mixture reaches 80 to 85 degrees (F). It's okay to overshoot the temperature slightly, but try not to let the temperature go past 100 degrees — you don't want to scramble the eggs before they go into the batter! If you've overshot the temperature, set aside to cool until an instant-read thermometer registers between 80 to 85 degrees. While the butter/milk and egg/vanilla mixtures are cooling, whisk together 1 1/2 cups all-purpose flour, 1 1/2 cups granulated sugar, 1/4 cup potato starch, 2 teaspoon baking powder and 1 teaspoon kosher salt in the bowl of a freestanding electric mixer fitted with a paddle attachment. Check your liquid mixtures temperatures. When both mixtures are between 80 to 85 degrees, they're ready to go. Begin mixing the dry ingredients on low speed, then slowly drizzle in the milk mixture. Beat until just combined. With the mixture on low speed, add the egg mixture in three additions, beating until just incorporated between additions. The batter should be silky and smooth and very liquid. Transfer the batter to the cupcake pan by filling each cupcake liner wither 2 tablespoons of batter (you can use a 1-tablespoon cookie dough scoop for this process, which I highly recommend), or until the liners are two-thirds full. Bake in the preheated until nicely risen and golden brown, 20 to 23 minutes. 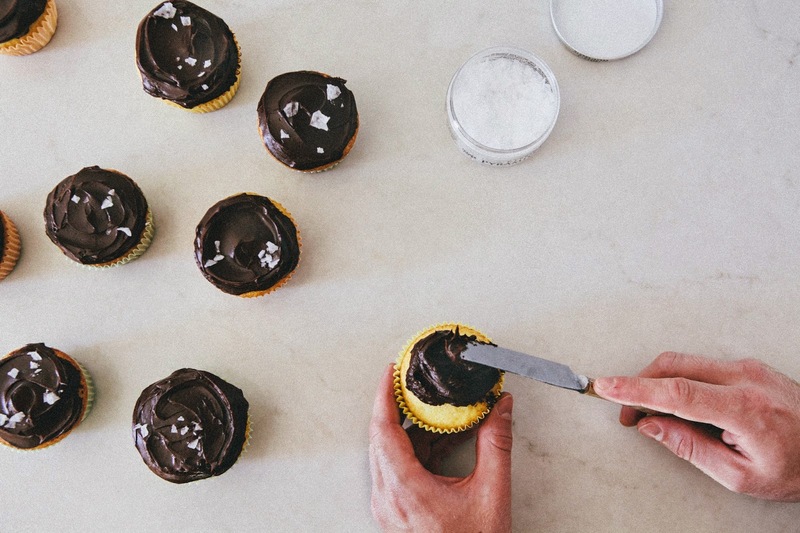 Immediately transfer the cupcakes from their pans and onto a wire rack to cool completely. 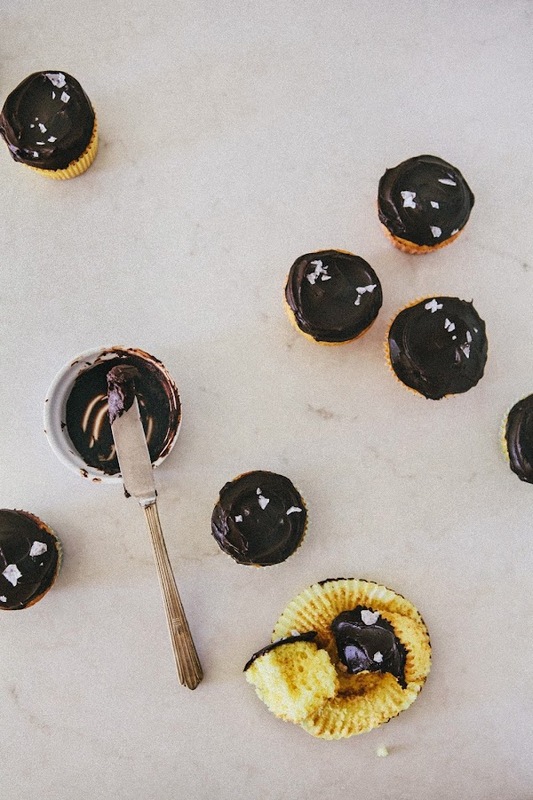 Combine 6 ounces dark chocolate, 1/4 cup unsalted butter and 1 tablespoon light corn syrup in a double boiler or a heatproof bowl sitting on top of a pan with simmering water. Melt completely, using a heatproof rubber spatula to stir occasionally to release heat and fully combine the ingredients. Once the chocolate and butter have fully melted, remove from heat. Whisk the mixture gently to release more heat, before whisking in 1/4 cup crème fraîche and 2 tablespoons half-and-half. Continue whisking until both the crème fraîche and half-and-half are fully integrated and the frosting is a uniform dark chocolate color. 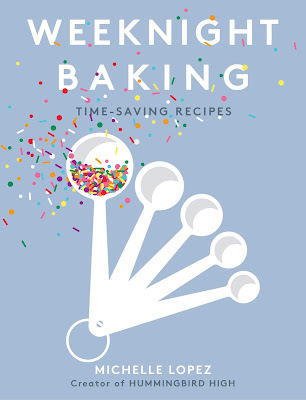 Set the frosting aside for 15 minutes to cool some more, giving the frosting a gentle whisk or two every 5 minutes to allow heat to escape. After 15 minutes, use the frosting. At first, it will seem too liquidy, but the frosting will quickly cool as it is spread throughout the cake. Work quickly to frost the cake before the frosting cools completely — it will harden as it cools. 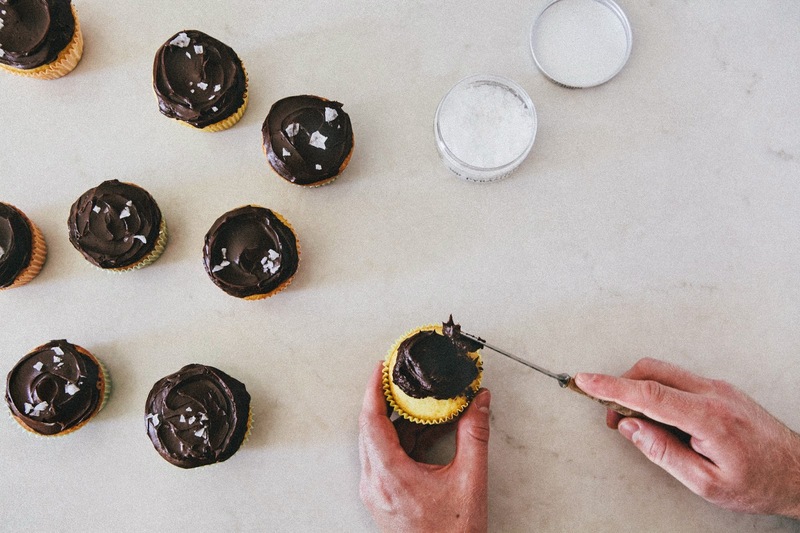 Use an offset spatula or a butter knife to divide and spread the frosting evenly between the cupcakes, and sprinkle each with a pinch of flaky sea salt. I have to say I am impressed! And you know what? This frosting is a frosting of my dream! I am a pure chocoholic....and having no butter or sugar in it makes it what I wanna make immediately! These look awesome! I love the sea salt on top - beautiful and delicious! I never thought to use potato starch either so its super inciting! Wonderful review and great sounding recipe to try! Have been a devoted fan to Bob's Red Mill since being based at PDX years ago. Discovered a treasure trove of their products at Spicer Bros. Produce in old Oregon City. Thanks for the inspiration!! HAHA "he is a real person." Also HEYO GIF. Look at you! It's weird, in the US, corn starch is definitely more common than potato starch! I'm sure it has to do with how the corn industry here is subsidized, etc. But anyway, yay for discovering me through Instagram and thanks for checking out my blog! I have so many recipes that call for potato starch but have never worked up the nerve to buy it, looks like I should! I love these pictures x 1000, michelle! i hear ya too - there is nothing better than a darn perfectly flavoured rich and beautiful cupcake! love those beautiful jagged salt flakes! mmmmm. 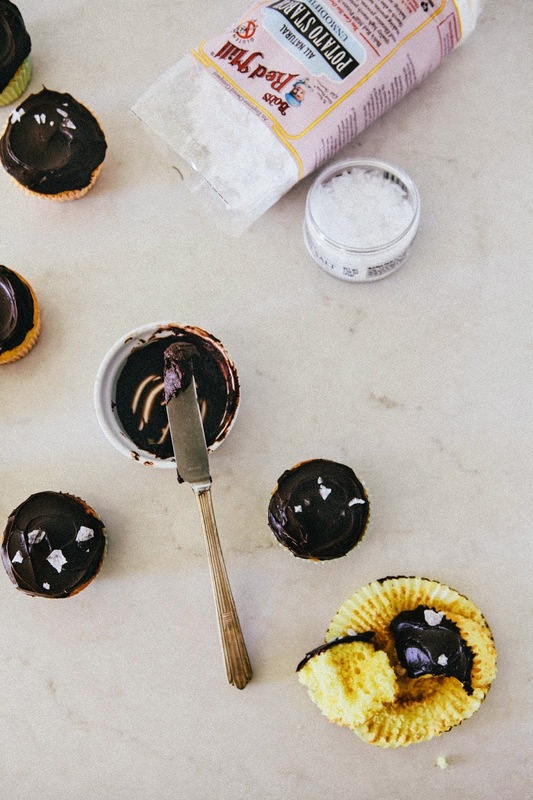 i think i have potato starch kicking around in my cupboard - i bought it an asian grocery superstore here in vancouver - i am dying to try your dark chocolate creme fraiche frosting! That gif!! 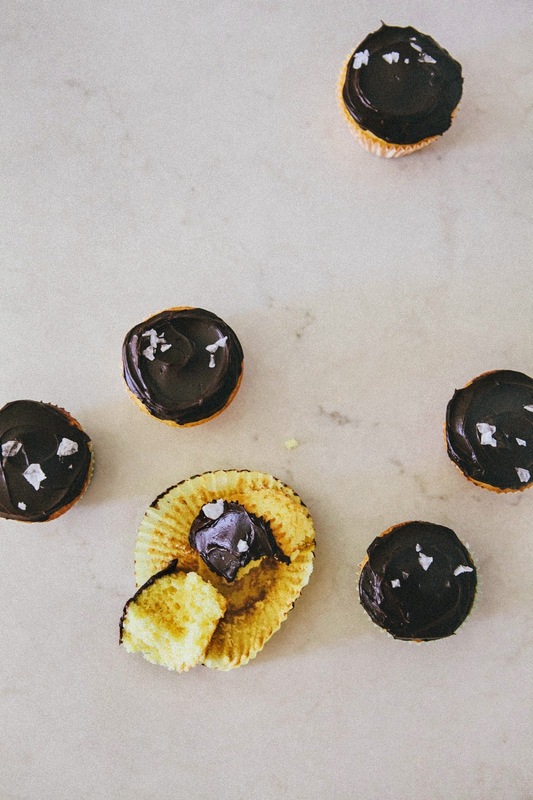 Yes to flaky sea salt toppings and these simple & classy cupcakes! On another note, I'm really surprised potato starch is hard to come by in the U.S. as it's such a staple here in Europe... You can get it at every store, even the tiny ones. Interesting about potato starch -- somebody from Australia also commented that potato starch was easy to find over there. Here, cornstarch is wayyy more common. These look absolutely amazing - planning on making these tonight!